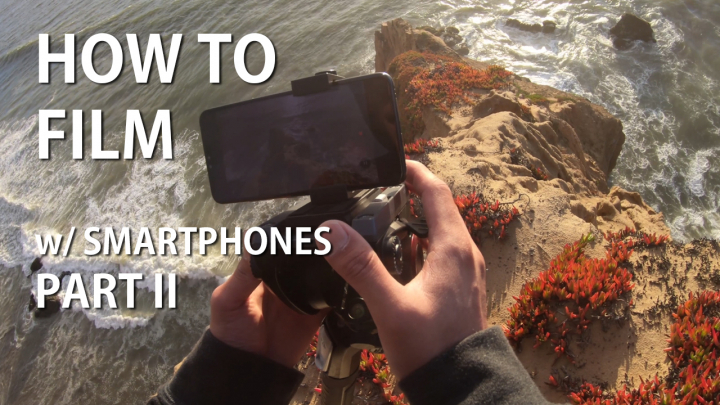 In my first article about How to Film Professional Videos w/ Android Smartphone, we covered the basic of using a tripod, fluid-head, and using the LG V20 manual video mode to get professional quality videos from a smartphone. In this part II, we go in more depth by taking our smartphone out in the field with the latest LG V40, which has a ton of improvements over the V20. Of course, you do NOT need an LG V40 but preferably a phone that has good video quality such as the Galaxy Note 9, Galaxy S9/S8, or even Xiaomi Mi8 or Pocophone would work. Tip 1 – If your smartphone has EIS, TURN IT OFF! Now, the LG V40 now comes with EIS(Electronic Image Stabilization) for all 5 cameras that it has. While EIS is great for using handheld, it interferes with tripod and slow movements of a fluid head, so you will want to turn it off and luckily on the V40, you can easily turn it off in settings. If you have OIS(Optical Image Stabilization), it will not interfere. Phones like Pixel 2 has EIS but there is no way to turn it off, I would actually avoid using phones like Pixel 2 for professional videos as you will get a lot of stutter when making videos with a tripod, making it unusable. Also when you turn off EIS, you get much higher quality videos as EIS works by cropping your video to stabilize and you will also lose details when using EIS. This is why you want to use another source of physically stabilizing your smartphone such as using a tripod. Tip 2 – Use a tripod, fluid head, and slider! Well, this is no brainer, make sure you use some kind of stabilization, my recommendation is to start with a solid tripod, fluid head, and a slider. Now, the Manfrotto tripod and fluid head is not cheap but I still recommend you to spend more money now then getting cheap tripod of fluid head. I’ve bought a ton of cheap tripods and fluid heads in the past and they have ALL BROKE after a year or two. If you get quality products, they are going to last you 10-20 years easy. If you plan on making videos for more than a year, spend more money now on good equipment so you don’t have to keep buying new stuff. I still use my Manfrotto tripod and fluid head I bought 5 years ago and it is because they don’t break. If you do want to a cheaper route, just make sure you buy products with lots of 5 star reviews. Tip 3 – Try to slide SLOW! While very simple tip, you may want to slider your fluid head of slider SLOW to get the best quality results. If you slide too fast, your smartphone may not capture all of the details and your video may result in a lot of artifacts. Unless the shot actually calls for fast movement, try to slide slow as possible to get the best quality out of the small smartphone camera sensor. Tip 4 – Use a phone with lots of cameras! The LG V40 is a great smartphone with a main camera, wide-angle camera, and a 10X telephoto camera that will allow you to get 3 different angles from one spot. Especially if you are making videos in a tight spot as I did on the edge of a cliff, having more cameras on your smartphone will allow you to get more interesting shots without moving your tripod. In my case, I was able to get some really good shots near the edge of the cliff without putting myself in danger with the 10x telephoto camera. The wide-angle camera also helped me get very wide shots otherwise not possible with a normal camera angle. Samsung is supposed to also launch the Galaxy S10 next year with 3 cameras so if you like Samsung, wait for the Galaxy S10. And most smartphones coming out in 2019 will have 3 back cameras. Try to buy the best smartphone out with most cameras to increase the quality of your videos. I would not try filming professional videos with budget Android smartphones as they simply don’t have the best camera sensors and your hard work result in cheap videos. Tip 5 – Use a drone! Using a drone can make your video more fascinating and add that “high quality” effect. Whether you are making a video about real estate or your local business, mixing drone shots can really enhance your videos. For best drone shots, I highly recommend the DJI Mavic 2 Pro, which is easy to use and anyone can learn to fly it without crashing as it has 360-degree omni-directional obstacle sensing feature. Next story LG V40 Camera Long Exposure Star 4K Timelapse!